A beauty of European 35 mm projector design. It is now serving as "public stopper" in front of the former first cinema in Essen, Germany. 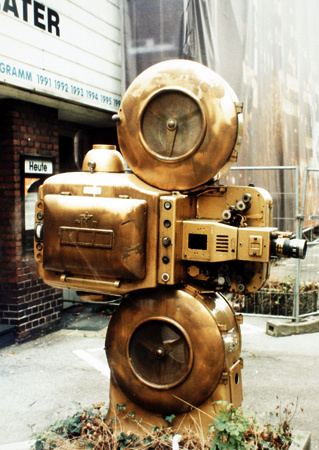 35mm theatre machines have been built by Frieseke & Hoepfner in Erlangen, near Nürnberg, Germany up to 1963. Chief engineer / constructor was Dr. Ing. A. Jotzoff. He designed two 35mm-only-versions: FH66 and FH77. Approx. 5000 pcs. went into production. The much more sophisticated FH99 was made in several versions. FH99 carbon arc, 500mm carbon electrodes giving approx. 60 min. continuous running time and the FH99X, xenon with vertical xenon lamp in a very special lamp house design and the famous but very rare FH99U, capable to show 35mm and 70mm films. Less than 50 have been manufactured. This machine has a lot of advantages, its design is strict modular. Could be assembled as left or right machine, because every part from the film path could be turned left /right and/or upside down during assembling. A special electric motor running at low rpm with 0.75 hp drove directly the wind up device in the lower drum and was connected to the main gear box by a long timing belt. FH99U was designed for use in drive in theatres and Mr. Jotzoff and his team were the first in Germany to show open air cinema on a real gigantic screen close to the F&H factory as a marketing event. 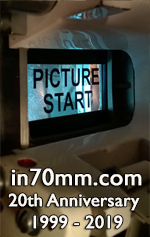 I do not know any projector with less running noise, but I'm quite sure no 70mm version has survived. Some FH99 in standard 35 are told to be on duty in Switzerland up to now. The picture I've send already shows the FH 99 (35mm) in scrap yard state. Some people, even professional movie buffs, do not know what they are dealing with, the German Museum, Munich f.i., does not have any FH machine in its collection.